Hawaii's Kilauea volcano is one of the world's most active, with a lake of molten lava at its peak and an eastern rift erupting near-continuously since 1983. Perched in the south east corner, it is one of five volcanoes that make up Hawaii's Big Island, and the home of Pele—the goddess of fire and mythological creator of the archipelago. Kilauea is described as an "effusive" volcano, periodically oozing lava from its main crater and along two active rifts or cracks—one in the east, the other southwest—with an occasional, but rare, explosion inbetween. 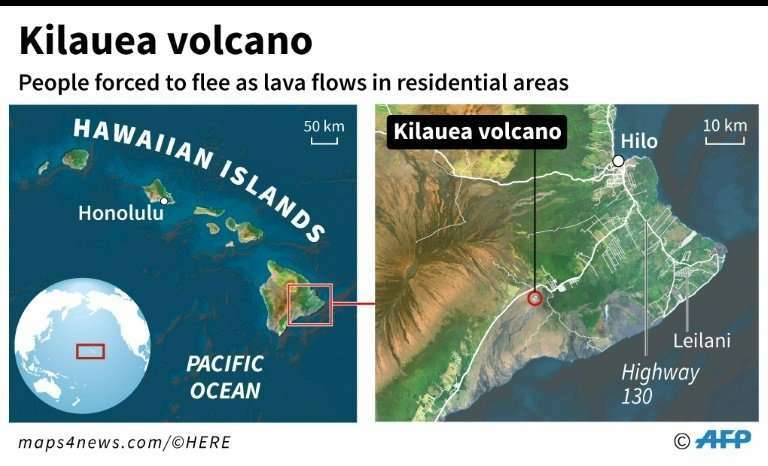 "It is quite usual for Kilauea to erupt not at the summit but through cracks on the volcano," expert Eleonora Rivalta of the German Research Centre for Geosciences told AFP. "What is slightly unusual, but only for the last tens of years, is that the eruption is taking place quite distant along the East Rift Zone, so close to some settlements. But this is within the known behaviour of the volcano." Kilauea, which means "spewing" in Hawaiian, began growing on the ocean floor about half-a-million years ago, with repeated lava flows settling one on top of the other to form a gently-sloping volcano which eventually stuck its head above water some 100,000 years ago. The summit, about 1,250 metres (4,100 feet) above sea level, sports the Halema'uma'u crater which holds one of the two largest lava lakes on Earth. In about 1790, a major crater eruption spewed hot ash and gas that killed possibly hundreds of people in Kilauea's deadliest discharge on record. The volcano has been almost continuously active since then. In 1924, hundreds of steam explosions from the crater hurled mud, debris and hot rocks weighing more than an adult African elephant as far as a kilometre away. Columns of ash and dust rose more than 3km into the air. One person was killed. Kilauea boasts two ongoing eruptions. In 1983, vents in the volcano's East Rift Zone started oozing. This eruption, of which the latest lava leak forms part, has added more than 200 hectares of new land to the island's southern shore. There are no signs of it slowing. The second ongoing event started in 2008, with a small eruption on the summit—the first in a quarter century. This opened a vent in Halema'uma'u crater through which scientists can observe an active, rising, lake of molten lava which occasionally spills onto the crater floor. Danger to life or limb? The current lava flow poses no immediate danger to islanders who had a long lead time for evacuation. "Basalt lava, such as is currently erupting, rarely does so explosively, and people can avoid lava flows by walking away provided they do not get cut off and trapped," said geoscientist David Rothery of the Open University in England. "When lava flows into water or over vegetation there can be gas-driven explosions, so it is dangerous to approach too close." Sulphur dioxide emitted from the volcano can be a respiratory tract irritant and dangerous if inhaled over long periods in large quantities. "However, merely smelling some sulphur in the air does not pose an immediate danger," said Rothery. Any eruption may go hand in hand with earthquakes, said Rivalta, adding "it could always occur that an eruptive fissure opens close to a house." 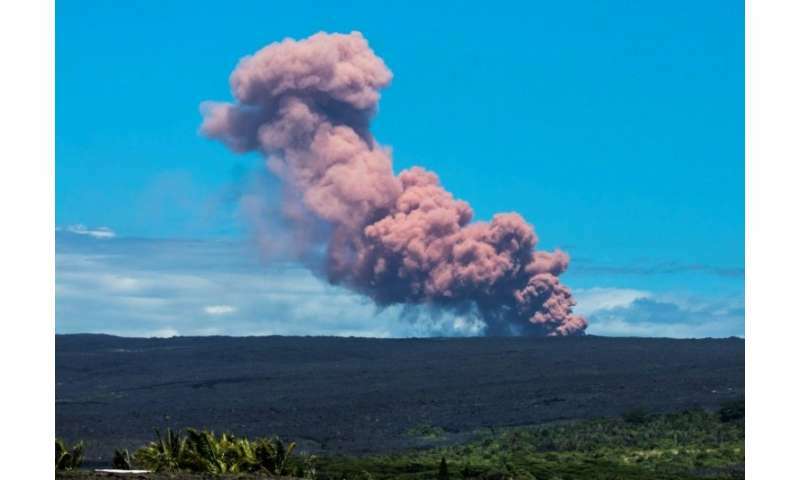 While Kilauea appears to be more active now than it was last year, "this does NOT mean that it is 'going to blow'," Rothery said. "Hawaiian eruptions are rarely explosive on a large scale. There may be further eruptions of lava." Atmospheric pressure -- Record low in Kansas?